Home › Blog › ServiceNow’s next stop is… Madrid!! Exciting news for ServiceNow, because it just officially launched its new “Madrid” release at the end of last week!! A great opportunity for Odysseus, as ServiceNow IT Business Management (ITBM) partner, to take a deeper look at this new release. Let’s dive into more details and focus on some of these specific features. Within this newest release the Portfolio level of SAFe was added the Essentials functionality. The big question is how and to what extend the Portfolio level of SAFe within ServiceNow can support the framework’s portfolio level. At the same time providing the link to all the levels below (Program and Team level). An additional (portfolio) level has been added into the SAFe Board where it enables portfolio managers to capture, prioritize and monitor the progress of epics in a single view in the form of a visual board. This enables users to align portfolios with business priorities. The portfolio level has also been added to the backlog functionality where epics can be created, scored (WSJF Score) and prioritized for the specific portfolio. To conclude this section, the question would be… can this added functionality fulfil the need for SAFe portfolio management as defined in the SAFe framework? The answer would be partially…it is a step in the right direction, however we expect this functionality to be expanded in one of the upcoming releases. The investment portal, which was already available in the London release and replaced the project status portal, is one of areas where the PPM Suite has improved significantly. It provides a full combined view of projects and demands containing financial information, deadlines and other significant information. The flexible nature of this portal, with its drag and drop functionality, possibility to create, save and share filters, and interactive widgets makes it the place to be for tracking and monitoring of portfolios. Looking at the portal in more detail, the main added value in this release is the ability to directly navigate to the details of a specific project / demand or even the details of a cost plan. When focusing on the financial data either of a demand or a project, the project baseline functionality was introduced in the London release. However, in the Madrid release we can also compare these baselines. Meaning reviewing the various deltas of the financial data, monitoring what has changed and being able to act up on those changes accordingly. Be able to track changes that may occur during the execution of a project or demand this new feature adds significant value. This new feature will allow users to open the Application Roadmap showing all demands / projects from an Application Portfolio Management perspective; summarizing which ongoing investments are linked to a specific business application. The Application Roadmap is a simplified view of the investment portal but with a focus on a specific business application. It is meant to retrieve information for projects and demands that are linked to that specific application. However, detailed financial data related to these initiatives is missing in this overview. As financial data could play an important role the expectation would be that this should be included in the “Application Roadmap”. As an alternative you can easily navigate to the investment portal, create a view based on all projects and demands that are linked to a business application and retrieve the information you need. Including the financial information which is missing from the “Application Roadmap” functionality. This view can then be shared with other stakeholders in ServiceNow. The Application Roadmap as mentioned above is meant to retrieve information for projects and demands related to a specific application but it does not contain any financial data. If financial information will play a significant role, which happens quite often, the alternative that is described would be more appropriate. It will be interesting to see whether the application roadmap view will be enriched with more valuable information in the upcoming releases. 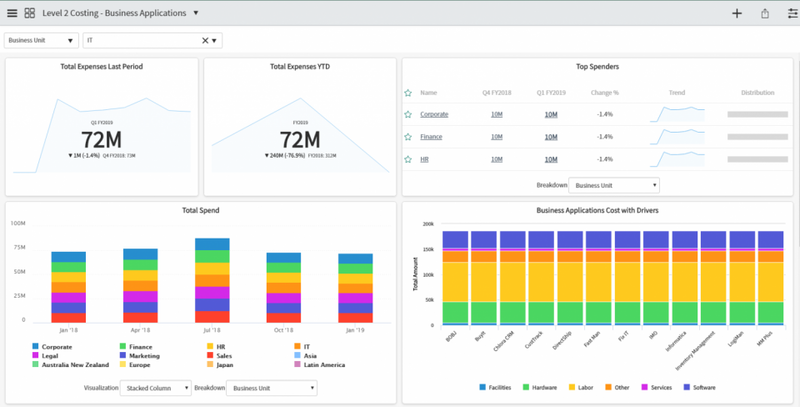 In the Madrid release, ServiceNow has invested in providing useful out of the box dashboards and reports that can be used by the various users. The PMO Dashboard is a good example of a collection of reports that bring value to the business by providing an extensive overview of investments. Various reports that provide all kind of information related to project health, data quality, financial information (planned vs actual) are some further examples within the PMO Dashboard. ServiceNow investing in the reporting capabilities by providing new out of the box reports and dashboards that definitely bring value to the business is something worth mentioning. ServiceNow has introduced a new mechanism to define financial rates and how they are managed. The rate model can be used to define different rates from various entities (project, demand, project task, user, group, role, or resource plan) within a specific time frame. It is worth mentioning, that if the project or demand is not associated with a rate model then it will pick up the default labor rate. A collection of multiple rate lines defines a rate model. Every rate line can contain a unique combination of various criteria which will define an hourly rate for either resources, groups or roles within again a specific timeframe. “You can create multiple rate lines for the same set of criteria for different date ranges without any overlapping dates”, source: docs.servicenow.com. This newly introduced functionality provides flexibility; being able to create a specific rate structure deriving from a combination of different criteria and entities. Making it possible to build a rate matrix will be of added value looking forward. This is a next step in the direction of a more flexible financial reporting mechanism for application and project portfolio management. We are curious to see further improvements in the area of financial and multi-currency reporting for our global ITBM customers. ITFM within ServiceNow allows someone to understand the various financial cost drivers and be able to manage and control those costs; in other words, to understand the cost value. Let’s have a look at some new features that have been introduced within ITFM. Additionally, other cost models can be configured separately. Additionally, key dashboards have been introduced to support the above-mentioned cost models (driven by Performance analytics by providing the key metrics as part of these dashboards) to be able to view all expenses on a single easily accessible dashboard. Hereby an example of a level 2 – business application dashboard, which provides visibility on the application cost, drilling down to different buckets that contribute to the application cost. The objective of financial modeling is to develop a cost model and bucket related costs together but also be able to allocate various costs to different business units within the business. ITFM is maturing within ServiceNow by providing mechanisms that can handle the complexity levels of the business. In addition, it can be used to understand the costs either to support key business applications or capabilities playing a significant role in aligning the financial investments of the business with the corporate strategy. When summarizing the Madrid release we could state that we are really glad that it is officially out! In combination with the London release many changes with strong capabilities were introduced, bringing this ITBM solution a step further to the next level. Establishing their leading position as an overall ITBM solution with dependencies between all IT/Company departments. We are looking forward to bringing these new functionalities to our (future) customers. And to see what ServiceNow has to offer next in the New York release planned for Q4 2019. For more information about anything related to ServiceNow please contact one of our consultants.